After three weeks full of amazing dives around the island of Bunaken in the National Marine Park, I would like to share my thoughts about this time in general and about a certain fish in particular.  The Schools of Red Tooth Trigger Fish in Bunaken leave me just speechless! You definitely see no other fish so often like the Redtoothed-Triggerfish when you are diving in Bunaken, meanwhile this fish is not really in the focus of most divers. The Redtoothed Triggerfish, or “odonus niger” in the latin term, is deep purple with bluish-green markings on their heads and glowing light blue margins on the tail, which is lyre shaped. This fish can reach a size up to 40cm and lives in outer reef slopes in 5-40m depth. Their pectoral fins are quite small, as a result they steer mostly with their dorsal fins, which looks quite funny. They also have the ability to use their fins to move with an exotic type of propulsion reminiscent of a propeller. This is one of the most singular swimming styles in the ocean. The Redtoothed-Triggerfish lives in the widespread Indo-Pacific and Red-Sea and is also found at the Afrian east coast, the Great Barrier Reef and the southern Japan islands. The Redtoothed Triggerfish has the amazing ability to change its color depending on their mood, food, feeding and water quality, from purple to blue and to bluish green. The islands around the Indonesian city of Manado offer one of the most diverse marine ecological systems in the world. With over 390 species of coral found here, it’s a beautiful place to grab your dive equipment and explore life underwater. There are many different kind of dive-site like wall-dives, ship wrecks, or sandy bottoms for people which are interested in muck-diving. During the last three weeks I had the chance to see dozens of different species of fish, corals and crabs. I couldn’t believe my eyes how many and how big turtles I saw during my first dives here. I had the chance to see a whole schooling of dolphins, some tunas and barracudas and at least one water-snake. But the one I have most enjoyed studying so far, the trigger fish. These fish are mostly planktivorous eaters. In the ocean, they can form schools and normally feed on zooplankton, which gets blown through by currents and sponges which is another part of their menu. They are also known to be carnivorous which means they eat many different types of meaty foods such as krill, clams,squid, urchins and small fishes. For reproduction, groups of harems each consists of one male and up to ten female, all of whom spawn together. The males guard the spawn until the fish larvae hatch. Because of this quite special behavior the Redtoothed-Triggerfish only reproduces just in its natural habitat. Nevertheless the Redtoothed-Triggerfish is a popular fish to be held in a very large aquarium because of its peaceful character and its handsome appearance. So, who cares about the turtles in bunaken? The Redtoothed-Triggerfish is a great example how nature developed a wonderfull shaped and regarding the behavior, highly interesting animal.